OpenAshDieBack » Identification of protein-coding genes putatively involved in infection by combining metagenomics analysis and protein orthologue clustering. Christine Sambles and David Studholme. University of Exeter, Devon. In order to identify fungal protein-coding genes associated with Fraxinus:Hymenoschyphus in planta interactions, we took an orthologue clustering approach. By identifying fungal transcripts that are present in four samples taken from infected ash and removing transcripts that are also present in the KW1 isolate could reveal some infection-related transcripts from H. pseudoalbidus. Additionally, F. excelsior transcripts present in the infected material and absent from F. excelsior with no signs of infection could identify transcripts involved in the plants response to infection by H. pseudoalbidus. 4 mixed material (AT1, AT2, Holt & Upton). This resulted in 36,945 transcripts being allocated to the bin for order Helotiales. The longest open reading frame for each Helotiales-binned transcript (Table 1) was translated into a predicted protein sequence. These protein sequences were clustered using OrthoMCL. Table 1: Numbers of transcripts and percentages of all transcripts for each sample or isolate that were binned to the order Helotiales using MEGAN. Between 4,548 and 5,551 proteins were clustered from each sample; the number of protein clusters was 6,505 in total. A Venn diagram of the clustered proteins can be seen in Figure 1. 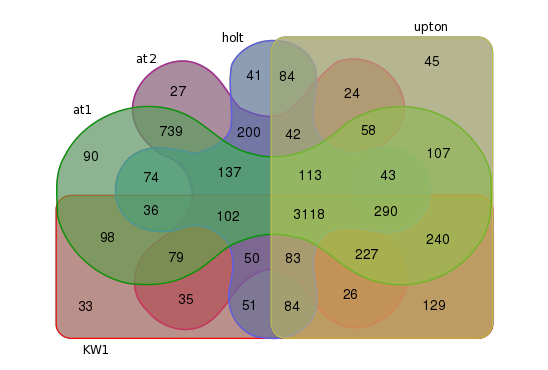 Fig 1: Venn diagram of Helotiales-binned proteins clustered with OrthoMCL for one H. pseudoalbidus isolate (KW1) and four mixed material samples from H. pseudoalbidus infected F. excelsior (AT1, AT2, Holt and Upton). There was a core set of 3,118 protein clusters from detectable transcripts. A set of 113 protein clusters was identified only in H. pseudoalbidus samples that were from infected F. excelsior (AT1, AT2, Holt & Upton) and 33 only identified in KW1, a H. pseudoalbidus isolate. These will be referred to as the ‘in planta’ and ‘ex planta’ groups respectively. The 113 protein clusters found only in H. pseudoalbidus infected F. excelsior (in planta) contained a total of 565 transcripts (459 excluding isoforms). We annotated the transcript sequences based on results of BLASTX searches. Additionally the GO, EC, KEGG, PFAM and CAZy (Carbohydrate-Active enzymes) databases were used to annotate the full set of 565 transcripts. GO, EC and KEGG annotation were inferred using annot8r (Schmid and Blaxter 2008), PFAM domains were identified with Pfam scan (a wrapper script around hmmpfam) and CAZy-family members were annotated using the CAZYmes Analysis Toolkit (CAT) (Park, Karpinets et al. 2010). GO analysis revealed a reduction of growth-related and an increase of cell differentiation and proliferation proteins in infected material (Fig 2). Figure 2: Gene Ontology (GO) analysis of the the pan-proteome (KW1, AT1, AT2, Upton, Holt) compared to in planta proteins. The in planta proteins were translated from Helotiales-binned transcripts (MEGAN) and were identified only in H. pseudoalbidus samples that were from infected F. excelsior (AT1, AT2, Holt & Upton). The pan-proteome proteins were also translated from Helotiales-binned transcripts (MEGAN) and include the isolate, KW1. Myosin head (motor domain) (Pfam: Myosin_head, PF00063) & Chitin synthase (Pfam: Chitin_synth_2, PF03142)RhgB_N|fn3_3|CBM-like. BLASTX hits from the in planta transcripts included putative CFEM domain-containing protein (Marssonina brunnea) and Galactose mutarotase-like protein (Glarea lozoyensis). The Galactose mutarotase-like protein is of interest as it is also similar to rhamnogalacturonate lyase found in Aspergillus spp. and is known to degrade plant cell walls by cleaving the pectin backbone (de Vries and Visser 2001). Some CFEM-containing proteins are proposed to have important roles in fungal pathogenesis (Kulkarni, Kelkar et al. 2003). PFAM domains and families in the ‘pan-proteome’ of KW1, AT1, AT2, Holt & Upton were identified using the hmmpfam wrapper script, Pfam scan. These were compared to the PFAM annotation of the ‘in planta’ group to identify over-representation of specific domains within this group. 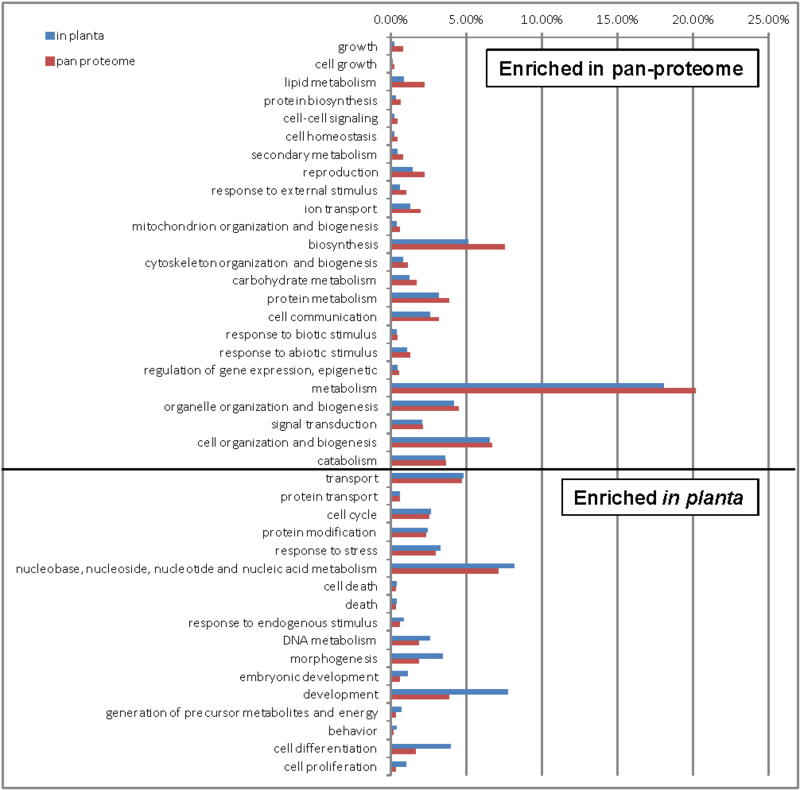 The domains and families in which >80% annotations were present in the ‘in planta’ group when compared to the ‘pan-proteome’ are shown in Table 1. Table 1: Pfam domains and families in which >80% ‘pan-proteome’ annotations were present in the ‘in planta’ group (http://pfam.sanger.ac.uk/). Porphobil_deam and Porphobil_deamC (6/6) were found in two AT1 isoforms, AT2, two Holt isoforms and Upton. There were no peptides with this domain in the Helotiales binned KW1 proteome. Heme-biosynthetic porphobilinogen deaminase protects Aspergillus nidulans from nitrosative stress. In A. nidulans, a novel NO-tolerant (nitric oxide-tolerant) protein PBG-D (the heme biosynthesis enzyme porphobilinogen deaminase) modulates the reduction of environmental NO and nitrite by flavohemoglobin (FHB, encoded by fhbA and fhbB)) and nitrite reductase (NiR, encoded by niiA) (Zhou, Narukami et al. 2012). NO is part of the plant hypersensitive response, a localized programmed cell death and conﬁnes pathogen to site of attempted infection (Mur, Carver et al. 2006). Proteins matching the ‘copper binding proteins, plastocyanin/azurin’ family (Pfam: Copper-bind, PF00127) (3/3) domain were found in AT1, Holt & Upton. OrthoMCL clustered an AT2 protein with them, but the assembled transcript was incomplete at the 5’ end and the PF00127 was therefore not present. BLASTX searches indicated an amino acid sequence similarity to cupredoxin from Glarea lozoyensis and HHPred predicts similarity to cucumber stellacyanin. Due to the amino acid sequence similarity between the phytocyanins and fungal laccases, this may potentially be a laccase. White-rot fungi (e.g. Trametes cinnabarina, Trametes versicolor and Phlebia radiata) are reported to produce laccases which degrade lignin (Tuor, Winterhalter et al. 1995; Eggert, Temp et al. 1997) and laccase-mediated detoxification of phytoalexins generated by the plant defence systems has been observed in Botrytis cinerea (Pezet, Pont et al. 1991; Sbaghi, Jeandet et al. 1996; Adrian, Rajaei et al. 1998; Breuil, Jeandet et al. 1999). The Hpt domain (Pfam: Hpt, PF01627) (5/5) was identified in two AT1 isoforms, AT2, Upton & Holt. The histidine-containing phosphotransfer (HPt) domain is a novel protein module with an active histidine residue that mediates phosphotransfer reactions in the two-component signalling systems (Catlett, Yoder et al. 2003). Fig 2: Phylogenetic tree of H. pseudoalbidus sequences from four OrthoMCL clusters where at least one sequence in the cluster contains a CFEM domain (Pfam: PF05730). The names of full-length proteins are shown in black; in grey are names of shorter length proteins from incomplete transcript assembly that lack a CFEM domain but that cluster with CFEM domain sequences due to sequence similarity and inferred orthology. 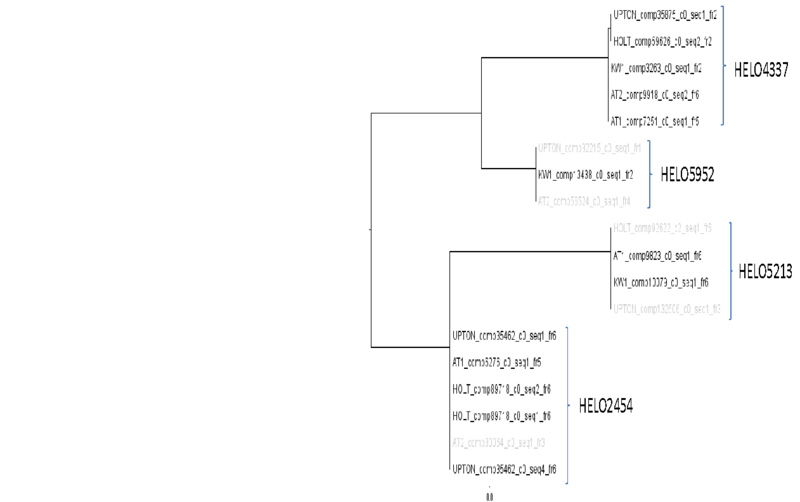 Orthologue clustering was performed on all translated transcripts binned to the Helotiales using MEGAN from the one H. pseudoalbidus isolate (KW1) and all four H. pseudoalbidus samples that were from infected F. excelsior (AT1, AT2, Holt & Upton). The 33 clusters (representing 72 peptides) in the ex planta group which were only identified in the isolate KW1 were annotated with PFAM as previously described. This resulted in identification of 17 Pfam domains/families (Table 2). This low number of peptides not identified in any of the H. pseudoalbidus infected ash samples limits the ability to perform any comparative analysis. Proteins putatively involved in plant-pathogen interactions have been identified from groups of translated transcripts exclusively found in planta and were not identified in isolate KW1. They included a copper binding protein within the plastocyanin/azurin family, porphobilinogen deaminase, a CFEM domain-containing protein and a Galactose mutarotase-like protein. Adrian, M., H. Rajaei, et al. (1998). "Resveratrol Oxidation in Botrytis cinerea Conidia." Phytopathology 88: 472-476. Breuil, A. C., P. Jeandet, et al. (1999). "Characterization of a Pterostilbene Dehydrodimer Produced by Laccase of Botrytis cinerea." Phytopathology 89: 298-302. Catlett, N. L., O. C. Yoder, et al. (2003). "Whole-genome analysis of two-component signal transduction genes in fungal pathogens." Eukaryotic cell 2: 1151-1161.
de Vries, R. P. and J. Visser (2001). "Aspergillus Enzymes Involved in Degradation of Plant Cell Wall Polysaccharides." Microbiology and Molecular Biology Reviews 65: 497-522. Eggert, C., U. Temp, et al. (1997). "Laccase is essential for lignin degradation by the white-rot fungus Pycnoporus cinnabarinus." FEBS Letters 407: 89-92. Kulkarni, R. D., H. S. Kelkar, et al. (2003). An eight-cysteine-containing CFEM domain unique to a group of fungal membrane proteins. Trends in Biochemical Sciences. 28: 118-121. Mur, L. A. J., T. L. W. Carver, et al. (2006). "NO way to live; the various roles of nitric oxide in plant-pathogen interactions." Journal of experimental botany 57: 489-505. Park, B. H., T. V. Karpinets, et al. (2010). "CAZymes Analysis Toolkit (CAT): web service for searching and analyzing carbohydrate-active enzymes in a newly sequenced organism using CAZy database." Glycobiology 20: 1574-1584. Pezet, R., V. Pont, et al. (1991). "Evidence for oxidative detoxication of pterostilbene and resveratrol by a laccase-like stilbene oxidase produced by Botrytis cinerea." Physiological and Molecular Plant Pathology 39: 441-450. Sbaghi, M., P. Jeandet, et al. (1996). "Degradation of stilbene‐type phytoalexins in relation to the pathogenicity of Botrytis cinerea to grapevines." Plant Pathology: 139-144. Schmid, R. and M. L. Blaxter (2008). "annot8r: GO, EC and KEGG annotation of EST datasets." BMC bioinformatics 9: 180. Tuor, U., K. Winterhalter, et al. (1995). Enzymes of white-rot fungi involved in lignin degradation and ecological determinants for wood decay. Journal of Biotechnology. 41: 1-17. Zhou, S., T. Narukami, et al. (2012). Heme-Biosynthetic Porphobilinogen Deaminase Protects Aspergillus nidulans from Nitrosative Stress. Applied and Environmental Microbiology. 78: 103-109.